Antimatter is extremely vulnerable, as it vanishes instantly on contact with matter. However, it has successfully been stored at CERN in the framework of various experiments. Recently, the BASE experiment succeeded in storing a few antiprotons for an exceptionally long period of over a year, with no loss. Now, a new European project aims to achieve a storage time of several weeks for one billion antiprotons, which would allow them to be transported. This would be the first time that antimatter had embarked on an inter-facility journey, which is possible only between two experiments at CERN. But why transport it if it’s so fragile? This original idea is the brainchild of Alexandre Obertelli, a physicist from the Darmstadt technical university (TU Darmstadt), who started working on it two years ago. His project, called PUMA (antiProton Unstable Matter Annihilation), aims to explore new quantum phenomena that might emerge from low-energy interactions between antiprotons and slow exotic nuclei. For this to be done, scientists need to trap antimatter and transport it to a facility that delivers radioactive ion beams. This project is thus a bridge between the GBAR experiment at ELENA, which produces antiprotons, and ISOLDE, which will supply the trap with the short-lived nuclei. 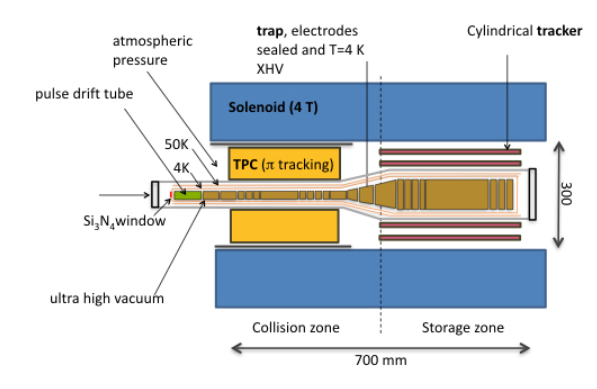 A specially designed, double-zoned trap of about 70 cm in length inside a one-tonne superconducting solenoid magnet will ensure that the antimatter cloud doesn’t get annihilated during its journey and that it can be stored for a long time. The storage zone will keep a large number of antiprotons at a cryogenic temperature of 4 K. The collision zone of the trap will host the interactions. Both parts of the trap will need to be kept under the extremely high vacuum of 10-17 mbar, which is 100 000 times lower than the LHC vacuum. Once ready, the whole structure will travel a couple of hundred metres down Route Einstein to reach its experiment site at ISOLDE. The project consists of three phases. First, 109 (one billion) antiprotons will be collected at the ELENA facility and stored in the trap. Second, the whole trap structure containing the cooled-down antiprotons will be loaded onto a van and transported to the ISOLDE facility. And finally, once it has reached its destination, the physicists will insert the slow exotic nuclei into the antimatter trap through an ultra-thin window. The extremely quick annihilation process will be closely observed. Moreover, the charge measurements of the emitted pions will make it possible to analyse the ratio of proton-to-neutron annihilations. Antiprotons were used as a probe for matter with stable nuclei at Brookhaven in the 70s and later on at LEAR at CERN. The results of this new experiment should provide evidence of new proton and neutron halos and help understand the development of thick neutron skins in radioactive nuclei, providing valuable information about unexplored quantum phenomena caused by the complex nature of nuclear matter. “This project might lead to the democratisation of the use of antimatter,” says Alexandre Obertelli. He plans to build and develop the solenoid, trap and detector in the coming two years, with the aim of producing the first collisions at CERN in 2022. Obertelli was awarded an ERC Consolidator Grant from the European Research Council and the five-year PUMA project was launched in January this year. Along with researchers from RIKEN in Japan and CEA Saclay and IPN Orsay in France, he has submitted a letter of intent to CERN’s SPS and PS Experiments Committee (SPSC) to pave the way towards PUMA becoming a CERN-recognised experiment.